Big Band Library: Mitchell Ayres "Scratchin' the Surface"
Ayres was signed to a recording contract, briefly by Variety, then for Vocalion, and, finally, on Bluebird, where he and his big band made just over 100 sides between December 1939 and July 1942. The most famous of his records was Make-Believe Island, a top hit in 1940. Sidemen who worked in his group included, at various times, trombonists John D'Agostino and Warren Covington; saxophonists Harry Terrill (Turetsky), Deane Kincaide and Babe Russin; drummer Joe Dale; and vocalists Mary Ann Mercer, Tommy Taylor, and Meredith Blake. Among Ayres' compositions were the tunes I'm a Slave to You, He's a Wolf, Scratchin' the Surface, and Madeira. During World War II, Ayres began conducting for various singers including The Andrews Sisters, and, as a musical director at Columbia, led studio orchestras which accompanied Paula Kelly and The Modernaires, Buddy Clark, and Frank Sinatra on records. Ayres joined "The Chesterfield Supper Club," a popular radio program which starred Perry Como, in late 1948. They moved into a weekly TV show in 1955. As Como's music director, he also made many RCA Victor recordings with him, conducting on such favorites as Papa Loves Mambo, You'll Always Be My Lifetime Sweetheart, Juke Box Baby, and Magic Moments, each arranged by Joe Reisman. friends are good musicians as well." "If I like a job I'll accept it first, and think about the money later." allow musicians to be acknowledged for their efforts." Likely because of that notoriety with Como, Ayres made some new, instrumental recordings under his own name for RCA Camden in 1953 and which were released on 45 rpm extended-play discs. They were followed by a reissue LP, "Dance Time" (RCA Camden CAL-266), the only one to collect a sampling of his band's original Bluebird sides, and a new, stereo record, "Have a Wonderful Weekend" (RCA Victor LSP-1603), mostly a series of medleys, done in late 1957. His own final album, "The Hollywood Palace" (Command RS 902-S.D. ), a mixture of pop songs and standards, was released in 1966, though he led the orchestra for singer John Gary's concert at Carnegie Hall in New York, a performance which came out on RCA Victor in 1967. 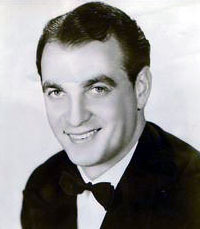 At the time of his death, Ayres was in Las Vegas conducting for singer Connie Stevens, who was appearing at the Landmark Hotel. In the mid-1970s, longtime Ayres musician Harry Terrill formed with singer Marion Herrman a reconstituted "Mitchell Ayres Orchestra" that worked in and around New York City. "Mitchell Ayres Dies in Accident: 'Fashions in Music' Leader Hit by Car in Las Vegas,"
New York Times, Sept. 7, 1969, p.86. "Mitchell Ayres Rites Set Today," Los Angeles Times, Sept. 9, 1969, p.A3. Record Research, Inc., 2002), p.26. Though perhaps best-known as music director for singer Perry Como, with whom he worked from 1948 to 1963, he played violin with various orchestras and got off to a good start with his own "Fashions in Music" ensemble, formed in 1937. One of his band's first engagements was extended from four weeks to seven months, followed by appearances in such states as Texas and Ohio, and a six-month job at the Village Barn in New York City. Portrait by Bruno of Hollywood.